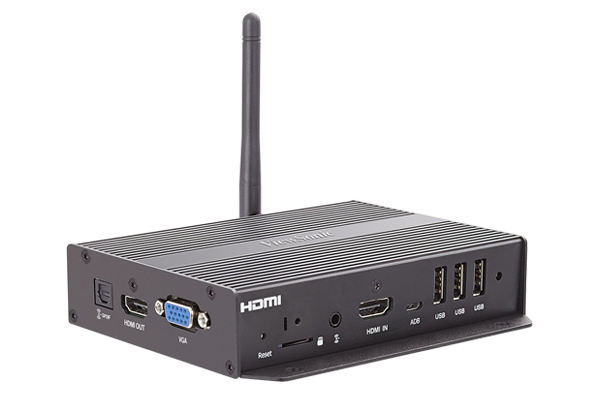 Deploy compelling digital signage with extreme reliability and stunning visuals with the ViewSonic® NMP580-W high-definition wireless network media player. Your content shines with 1080p video playback and access to rich content harnessed live from the cloud. Wireless connectivity and HTML5 support lets you easily deliver dynamic information at the point of service via the web, or from a network server. Manage it with ease thanks to the included content management software, as well as portrait and landscape design templates. And if you're worried about running out of storage, don't fret. Thanks to 8GB of built-in memory, the NMP580-W can store and play hours and hours of stunning high-definition content. Perfect for retail, hospitality, and point-of-sale advertising, the NMP580-W is the media player you can trust to deliver reliable messaging and dynamic multimedia for any of your large format displays.